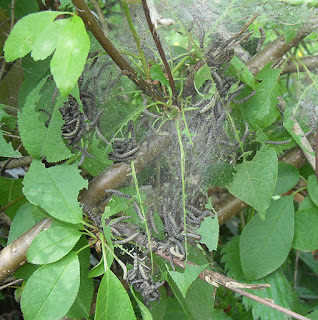 This is the time of year when often quite expansive areas of webs appear in some of our hedgerows. They are produced by species of small ermine moths who are seeking safety in numbers and also trying to disguise their prescence from anything that might like to eat them. I also imagine any bird trying to peck at them would get cobwebs stuck all over its plumage and beak. 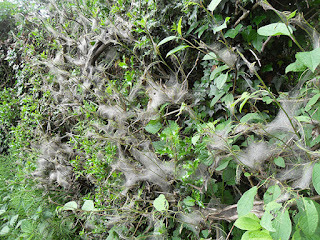 The webs slowly disintegrate over the summer and usually the hedgerows recover. 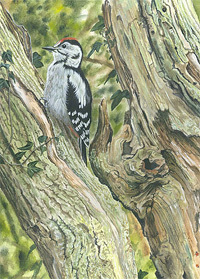 The adults can be found on the wing later on and all are white or greyish with many small black dots, hence the ermine name.